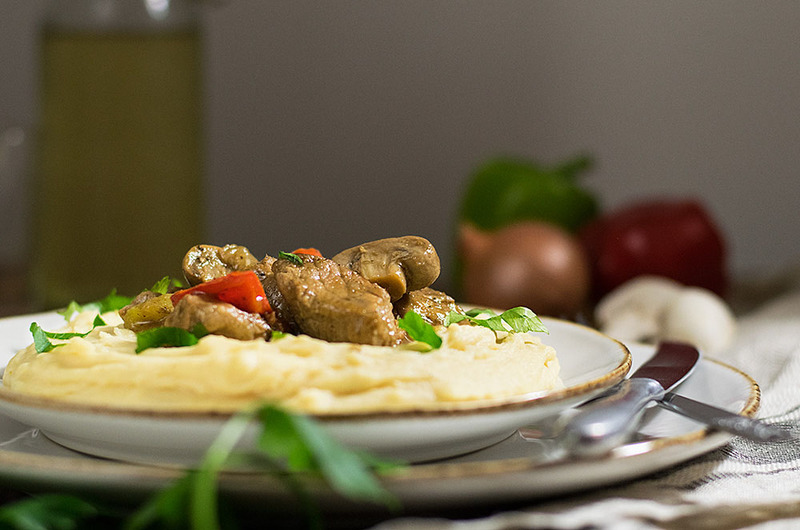 A Greek recipe for a delicious (and gluten free) dinner! 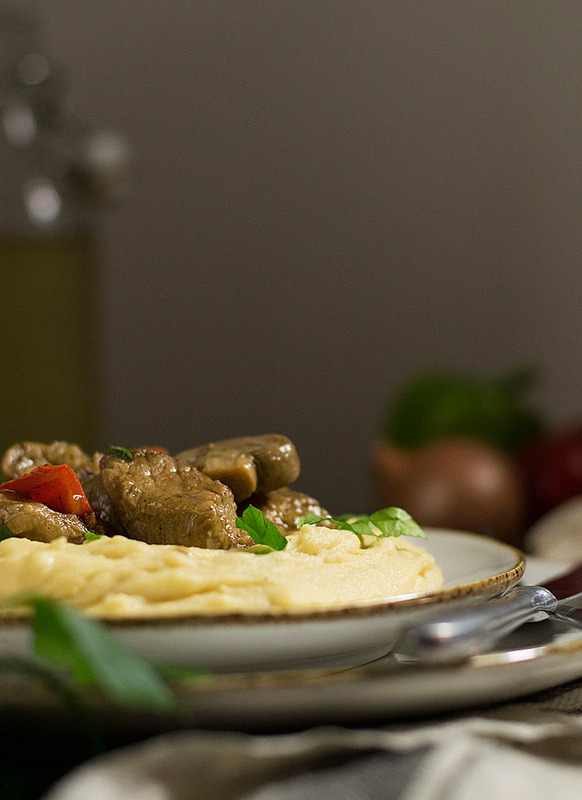 Bekri meze is one of the most popular Greek recipes. You may not find it in an expensive restaurant, but almost every little Greek tavern has it on the menu. Because it’s easy to make and it tastes awesome! Little pieces of pork meat are first browned with some olive oil and then slowly cooked in wine, until all of the alcohol gets evaporated and the meat is tender and succulent. In its plain version, this dish is consisted only of pork, onion, wine and some spices. I like to add some mushrooms and peppers, since I find they compliment the taste of the final dish and make it a bit more interesting! But what does bekri meze mean? The first word “bekri” stands for drunk in Greek, while “meze” means appetizer or more accurately, a small dish with the purpose not to saturate our hunger but to serve as something we can nibble on while having a drink (usually wine, ouzo or tsipouro). So, drunken pork is actually a pretty accurate translation for bekri meze! And in case you want to host a “Greek tavern” night, just make sure you’ve got plenty of wine and a few simple appetizer recipes, such as a mediterranean potato salad, some baked feta cheese, a plate of yellow split puree, this stew and some French fries! 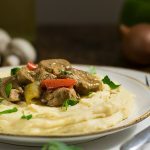 As I’ve said, this pork stew is usually served as an appetizer in Greek taverns, but you can also have it as a main course by serving it over mashed potatoes or rice (though some French fries wouldn’t be bad either!) And keep in mind that this recipe is prepared in one pot from start to finish, meaning less effort and clean up in the kitchen! Cook the pork pieces on high heat, in one layer and without stirring them until they get browned from one side. Then flip them over to brown from the other side also. After you add the mushrooms, stir until they water out completely and let them brown with the pork until they get caramelized and fragrant. Use a wine you enjoy drinking and not the cheapest one you can find! 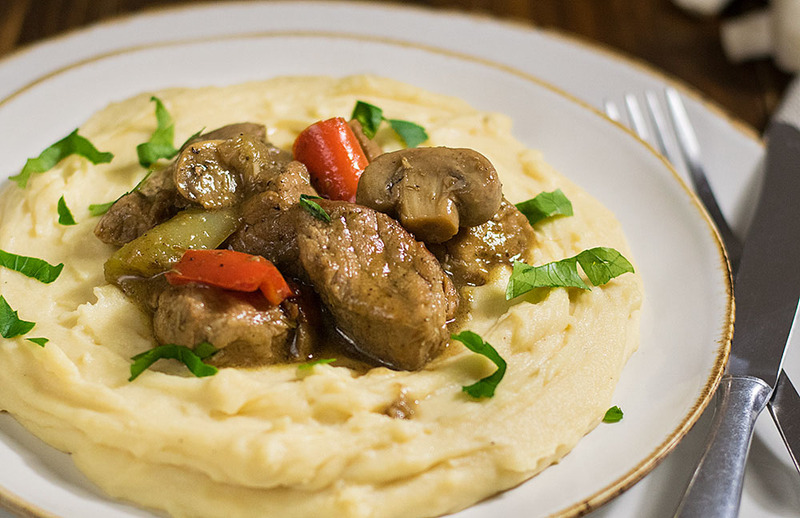 As any other stew recipe, this drunken pork tastes even better the day after you make it. So, you certainly can (and probably should)make the day before, store it in the fridge overnight and reheat it gently before eating. Similar to this recipe is the other well known Greek dish, Spejofae, which is a flavorful sausage and pepper stew in a tomato sauce. 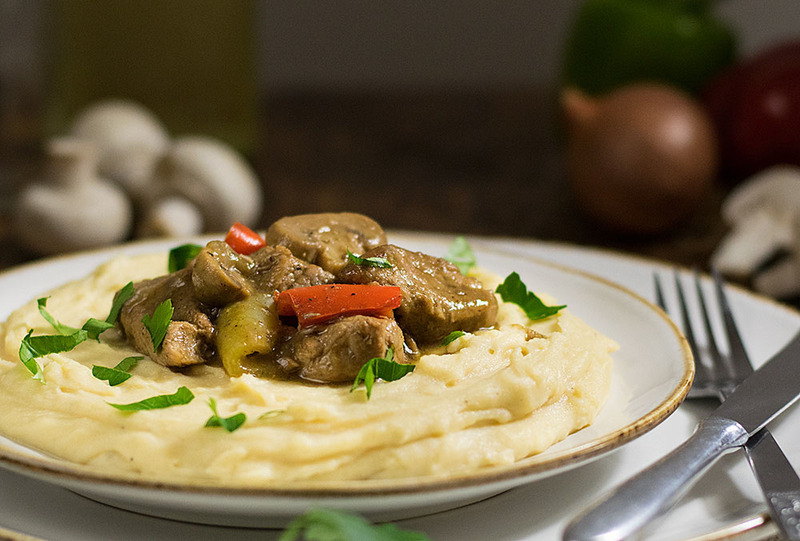 A Greek recipe for a delicious (and gluten free) dinner! 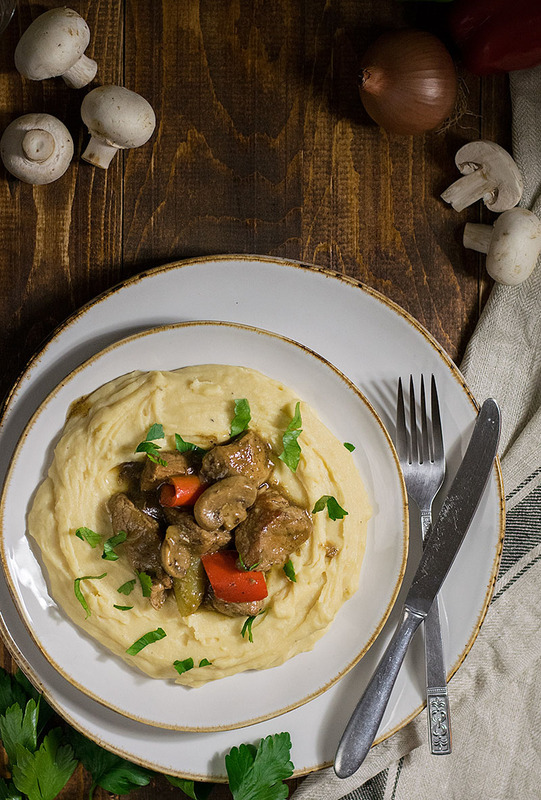 Pieces of pork, mushrooms and peppers are slow cooked in a rich wine sauce for the ultimate pleasure! Heat a large saucepan or a pot and add the olive oil and pork. Let the pork brown from one side and flip to brown from the other (about 7 minutes total). Add the mushrooms and stir until they water out completely and start to caramelize (about 7 minutes). Reduce heat and add the onion, the garlic cloves (whole), bay leaves, cumin, all spice and thyme. Cook until the onion is soft and translucent, about 5 minutes. Add the wine, salt and pepper and simmer covered, under very low heat, for 30 minutes. Add the peppers and continue cooking covered for another 20 minutes or until pork is very tender and soft and the sauce has reduced and thickened. Check the stew every now and then. If the sauce has reduced and thickened but the meat isn't ready yet, add a bit of hot water and continue cooking. Sprinkle with some chopped parsley and serve as an appetizer, or over rice/mashed potatoes for a main dish.